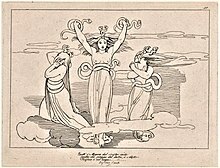 Megaera (/məˈdʒɪərə/; Ancient Greek: Μέγαιρα, English translation: "the jealous one") is one of the Erinyes, Eumenides or "Furies" in Greek mythology. Lamprière's Classical Dictionary states "According to the most received opinions, they were three in number, Tisiphone, "Megaera ... daughter of Nox and Acheron", and Alecto". Megaera is the cause of jealousy and envy, and punishes people who commit crimes, especially marital infidelity. Like her sisters Alecto and Tisiphone, as well as the Melian Nymphs, she was born of the blood of Uranus when Cronus castrated him. Minor planet 464 Megaira is named in her honour. ^ Related to μεγαίρω "to grudge, envy" from Proto-Indo-European *meǵh2- "great" (see R. S. P. Beekes, Etymological Dictionary of Greek, Brill, 2009, p. 917). ^ Graves, Robert (1960). The Greek Myths. London: Penguin Books. p. 37. ISBN 9780140171990. This page was last edited on 11 March 2019, at 20:33 (UTC).